The Yosta Livepor has been upgraded with more power. 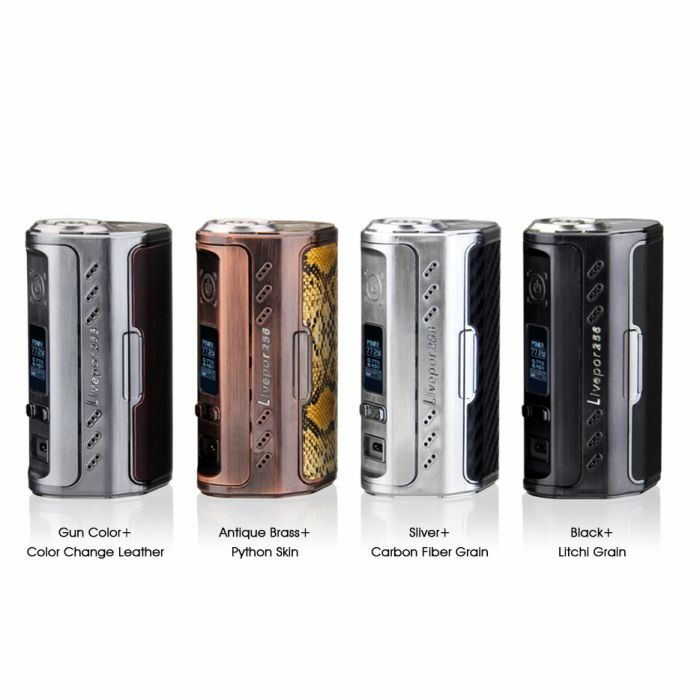 The affordable Livepor 256 features triple 18650 cells, juice taste adjustment mode, temperature control with popular heating elements, low resistance capability, 256 watts of output, fast 2 amp charging and interchangeable battery covers. The device has dimensions of 94.5mm x 42.5mm x 55.5mm and is available in black, silver and gun metal. Powered by triple 18650 batteries, this unit is able of operating for extended periods at high wattage. For easy access, the cells are located behind a back cover that is interchangeable. Optional finishes for the battery cover are crocodile grain, carbon fiber grain, toothpick grain and litchi grain. A micro USB charging system that utilizes 2 amps of current to quickly recharge the batteries without removal. Upon firing of the Yosta Livepor 256, green LED lights– surrounding the screen — light up. The rectangular firing button at the top of the control face is over-sized for effortless operation. In the middle, you will find a display that features a vertical menu with indicators such as current mode, wattage/temperature, resistance voltage, battery level and more. Two adjustment buttons allow for easy navigation of the menu. For a mod that is less tha $35, the Livepor 256 mod has plenty of versatile modes for a personalized experience. There is a variable wattage mode, temperature control with nickel/titanium/stainless steel as well as a mechanical mode for vape veterans. Additionally, there is a PTC mode that allows for taste adjustment settings. At 0.06ohm, resistance capability is low. And, temperature operation tops out at 600 degrees Fahrenheit while maximum wattage comes in at a whopping 256 watts.